This painting is another from the series ‘Journeying to the Oracle’, a journey I made for guidance on my artist path and its medicine. All journeys change us, no matter how big or small. Whether we are retrieving a destiny or popping down to the shops for some more milk – we are always changed by the experience. The key to making the most of any journey is the intent we hold, the one we set at the beginning of our journey as well as the one we hold throughout it. 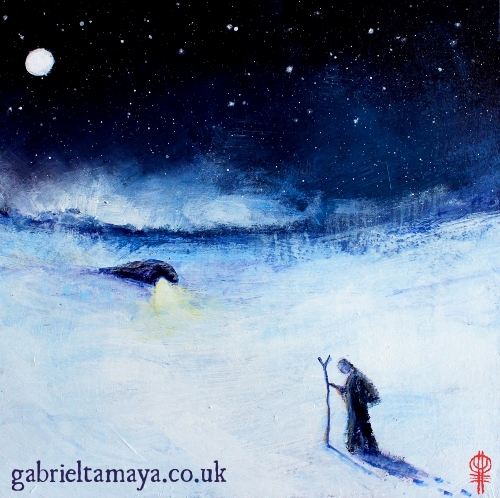 In shamanic journeying we are always clear about our intent before setting off, it provides purpose and focus for the journey as well as a context for us to understand the teachings and medicine we receive. The stronger and clearer our intent is, the stronger and clearer the answers to our questions / issue will be, which in turn provides us with a better opportunity to ground, learn and grow from it. The great thing is this doesn’t only apply to shamanic journeying, we can apply this to our small journeys, the journey we make each day during our waking hours, when we go to work and yes even when we pop down to the shops to get some more milk. It is our intent that sets the tone and scope of our dreaming (and we are always dreaming!) Intent is the lens through which we experience the world – by shifting our intent we shift our perception, and when we shift our perception we shift the world! It can be such a simple thing and yet is an extremely powerful act. The more consciously we work with our intent, holding it lightly but consistently on a regular basis, the more powerful it becomes. Our intent is the compass that dictates our direction in life from moment to moment, day to day and throughout our time here in this world. So needless to say, it is very important to know where you are pointing it and what experiences you are charting for yourself! How often do you set a clear intent for the day ahead of you? How often are you really clear about your intent behind all the things you do and experience from day to day? Are you 100% clear on what your intent for your life journey is? If not, WHY not? Try taking 5 mins at the start of the day and be really clear on what your intent is for that day, what is your purpose, what do you want to experience and how do you want to feel? I think you will be pleasantly surprised at how different a consciously intended day is!